Haikou Airport international terminal is separate to the main domestic terminal, built in a tropical style. 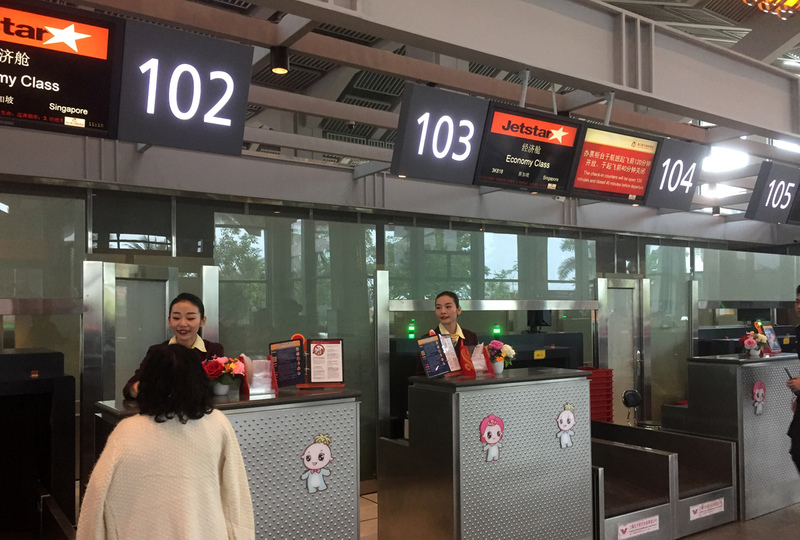 Check in is quick and easy with no queues for this Jetstar Asia flight. The ground staff are provided by the HNA Airports handling section, and were very polite and courteous at their duties. Check-in is completed swiftly although there is not much conversation with the agent. No queues or waiting for immigration and the security screening was also quick, with smiling and courteous staff. The terminal has a couple of cafes, some tax free shopping and is reasonably quiet at this departure time. This international terminal has no airbridges, and passengers are bussed to the aircraft, parked about 50 metres away. The boarding process was reasonably well conducted, and gate agents wished customers a nice flight. 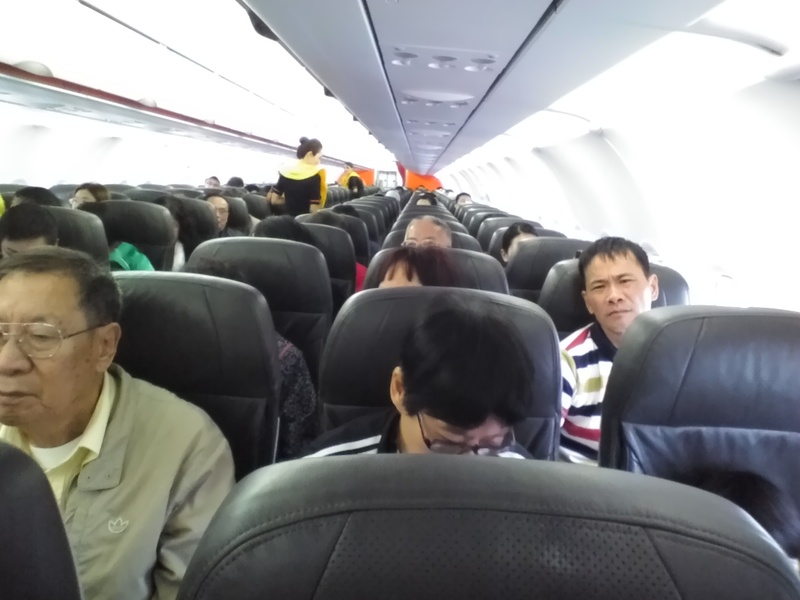 The front door and steps were used to board the Jetstar Asia A320, and with only about a 70 per cent load, the boarding was completed quite quickly. The flight purser by the front entrance offered a friendly and polite welcome as we boarded. 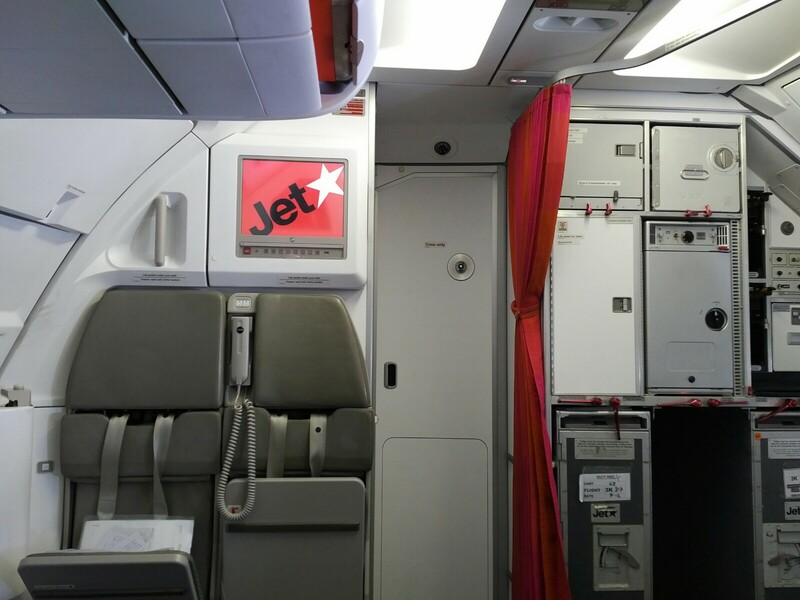 This regional flight to Singapore was operated by an A320, with an all economy class configuration for this low-cost airline. 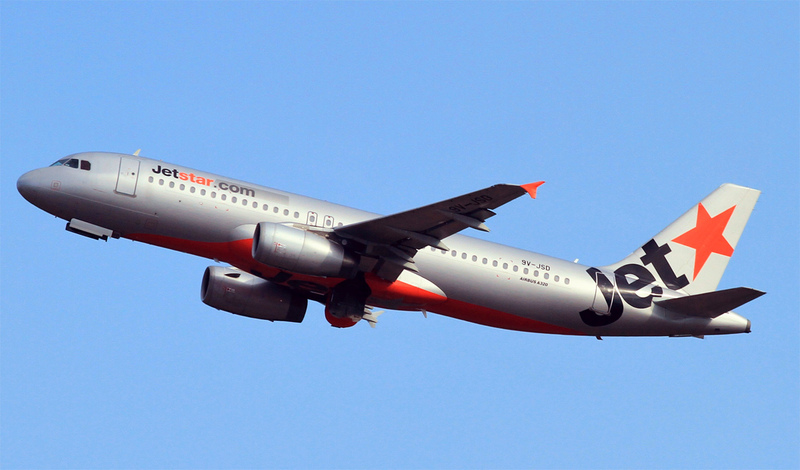 Jetstar Asia do offered a “business bundle” with added perks on some routes, but for this Chinese route it is not an available option. Cabin baggage is limited to a total of 7kg carry-on, based on 1 piece of baggage and a small personal item. Checked baggage allowance varies according to the type of ticket purchased. For this trip I had bought a ticket that included 30kg checked bag, although on the day this checked bag allowance was not used. I was seated at the front (aisle seat 2C), the A320 cabin seat layout is 3×3. Seats are relatively comfortable for a low-cost airline, finished in brown leather. No headrest covers provides the usual lack of hygiene issues, and the headrest does not adjust. The seatback has the top magazine holder that provides better legspace with no lower seat pocket. The cabin has a plain appearance, pale brown carpets and the only colour splash is the overhead locker that has red strips. Most surface areas appeared reasonably clean, although when one examines carpet edges, seatbacks and tables closely it does seem to portray a rather cheap approach to maintenance of cleanliness when compared to some full service airlines. Boarding is completed ahead of time and the doors closed ahead of time. Scheduled as a 3hr 40 mins flight, the Captain announces after boarding that it will only take 3 hours to Singapore. A small delay of 15 minutes in departure is incurred due to air traffic and the very slow take-off and landing separation at Haikou Airport. 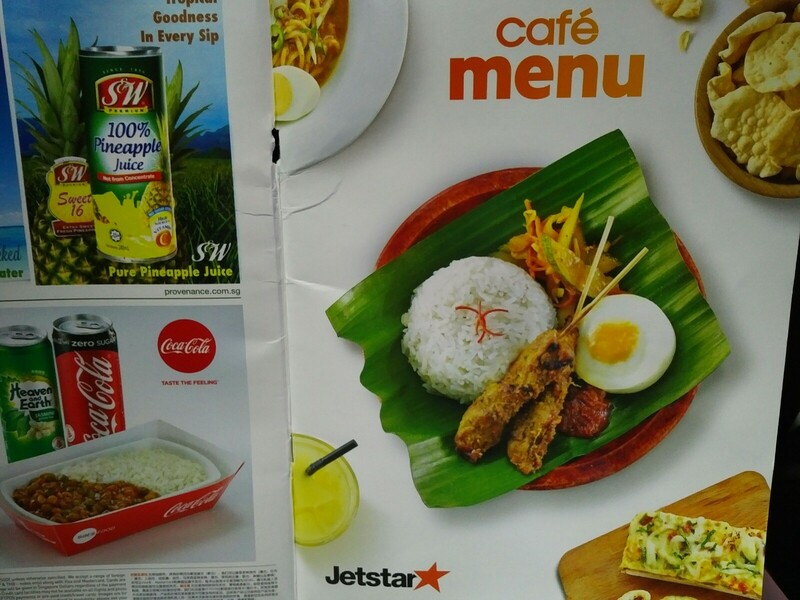 Each seat pocket has a copy of the Jetstar cafe menu, the copies inspected were reasonably clean and well presented. Pre-ordered at the time of my booking was the black pepper chicken dish. Preceding this the cabin staff served a cup orange juice, and then the hot dish was served from the galley cart as staff issued the pre-ordered meals. A small (300ml) bottle of water is supplied at the same time. All of the catering is provided by SATS Catering in Singapore, with Jetstar Asia back-catering all of these regional flights. The hot meal is in a plastic, foil covered dish, presented with plastic cutlery and a napkin. It was well heated, and for a relatively cheap, low cost flight option the quality was really quite good. 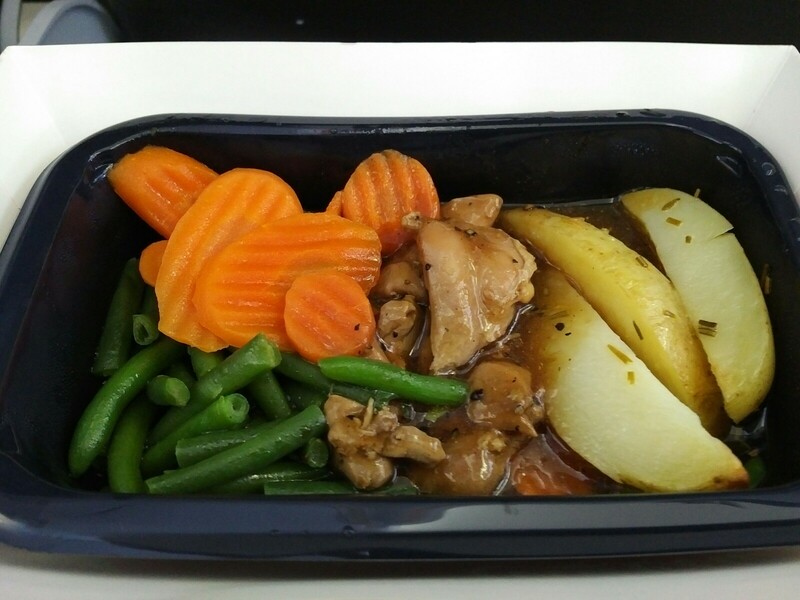 Tender chicken, potato slices, green beans and carrots served in a black pepper sauce. 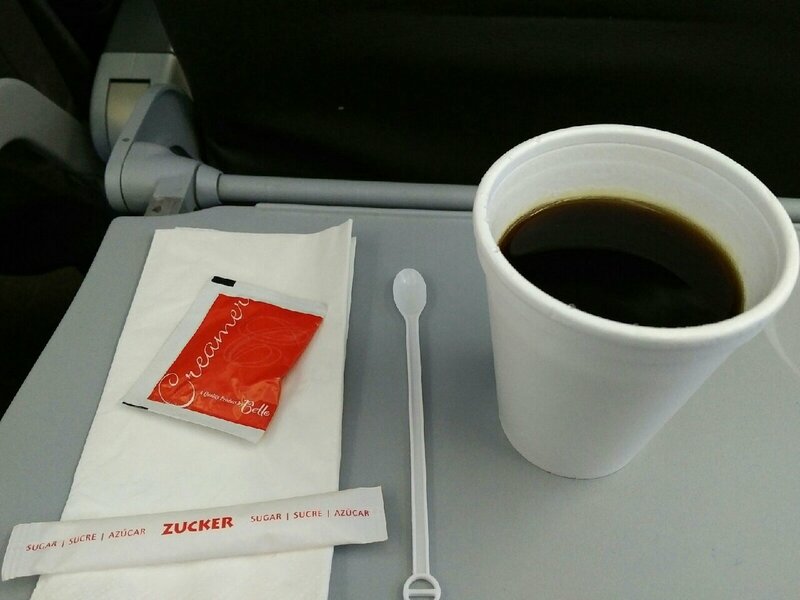 A little while later the buy-onboard cart service began, and cabin staff served a coffee to me at this time. There is no inflight entertainment available, and no option for streaming content on these flights. 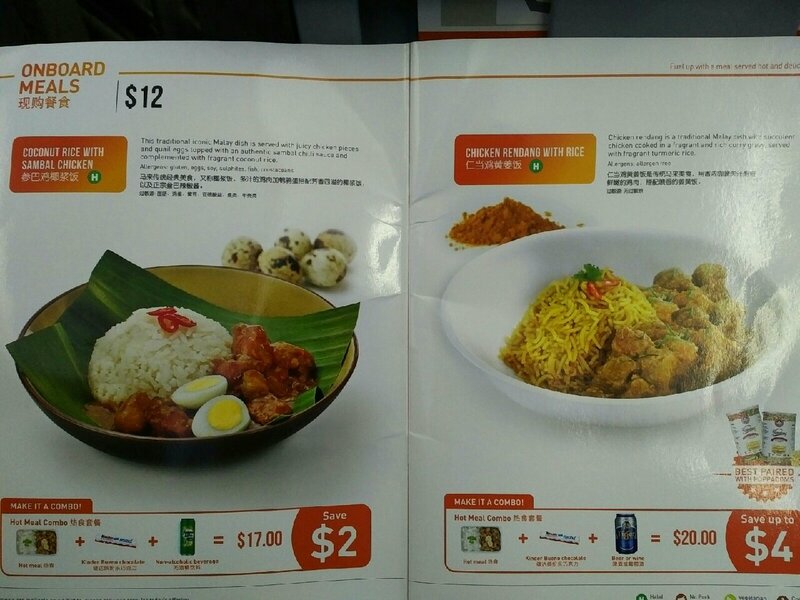 Also no wifi service is offered, and one would have thought that Jetstar Asia could be generating reasonable additional revenue from such options, as well as providing customers with a more fulfilling way to spend 3-4 hours onboard. No blankets or pillows are available on the flight. The staff service onboard today was polite and friendly, and where necessary it was authoritative to control certain customers for whom this appeared to be their first time flying. The adherence to cabin safety was noted to be good, and a very clear manual safety demonstration was provided before departure. The speed and efficiency for serving the onboard bar and catering, together with subsequent clearance was noted to be excellent and very well organised. There was a reasonable level of dialogue in their customer service, and they all appeared well trained and experienced. A brief Captain’s PA was made some 15 minutes before landing. Upon landing at Changi Airport, it was just a short taxi to our arrival airbridge at terminal 1. Cabin staff were by the door and wishing passengers a nice day as they deplaned. This was a cheap ticket for the route and flight duration, and from a value perspective there was little to fault. It got me from southern China to Singapore in reasonable comfort, ahead of time and for a very low price. Staff onboard were courteous and polite. My only gripe is with some of my fellow travellers on this flight. Many seemed to have an obsessive need to keep visiting the toilet, hanging onto and bumping into seats as they moved up and down the aircraft. Why can’t they learn to use toilets at the airport, and try to sit still once they get onboard what is a short regional flight?